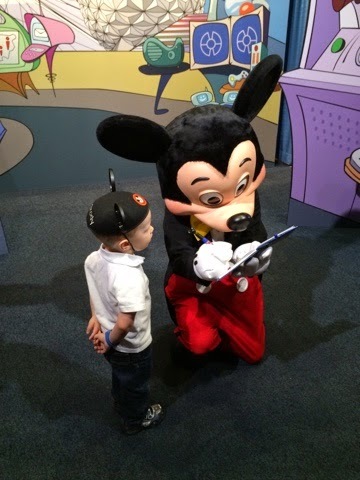 Our last trip to Disney was the first that we had a chance to experience MagicBands, FastPass+, and My Disney Experience - oh my! As you might recall from an earlier post, I was a both excited at the new changes and nervous about how they may work in the weeks leading up to the trip. 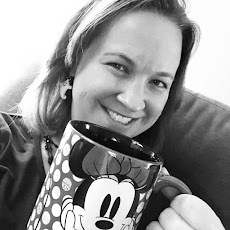 Now that I've had the opportunity to experience these changes first hand, I have a better idea of the benefits and some tips and tricks to help you navigate these new systems if you haven't traveled to WDW recently. Rather than one long post, I'm going to divide this into 3 shorter posts to make it easier for you to digest. Earlier, we reviewed MagicBands and today we'll take a look at FastPass+ and some tips to help you experience this new system. FastPass+ - If you traveled to Walt Disney World under the old FastPass system, you'll probably remember the stress surrounding a rush at rope drop in order to get your coveted paper FastPass. Getting a FastPass for attractions like Toy Story Mania at Hollywood Studios was a difficult (if not impossible) task. And, once you used a FastPass, you'd have to run to the other side of the park to pick up your next FastPass from another favorite attraction only to then turn around and head someplace else while you waited for that window. 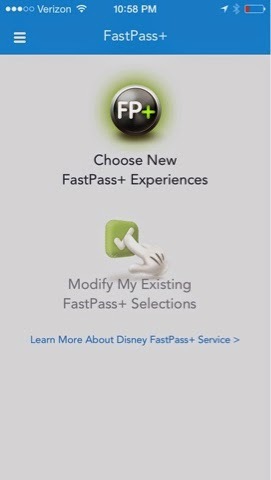 Enter the world of FastPass+. Disney has tried to reduce some of the stress and frustration in the parks by creating a system that allows guests to pre-select their FastPass attractions prior to arriving on property. Here's how it works. Guests who have a reservation on Disney property can begin reserving FastPass+ attractions 60 days in advance while those not staying on property can begin registering their selections 30 days in advance. Visitors select 3 FP+ attractions from one park each day. The Benefits - Gone is the stress and frustration of running around the park to pick up your paper FP+ tickets. Now you can pre-plan and prioritize what is important to you and your family and guarantee your FP reservations well in advance. When we booked our attractions at the 60 day mark, we were able to get everything we wanted - not the ideal times always, but able to secure the attraction. For someone who likes to pre-plan our trip, this is a nice feature. I also liked being able to choose 3 attractions and know the times early on. There were some occasions on previous trips when we would pull a FastPass for a time that conflicted with a dining reservation and we couldn't do anything to change either one on the fly that day. The new system gives you the chance to make sure things coordinate and line up prior to your arrival. You can also view and manage your selections from a mobile device app now which is great for the park - no more worrying about losing your return tickets! Since Brody was too little to ride many of the rides that are popular enough to need a FastPass, we decided to book ours mainly for character greetings and reserved parade and fireworks seating. It was great to meet so many characters without having long waits. Epcot Character Spot was one of our favorite FP+ stops. Mickey, Minnie, and Goofy with only a 5 minute wait! The "Kinks" - I like to call them "kinks" because FP+ is still relatively new on the WDW resort scene and I'm confident that some of these minor issues will be fixed along the way. If you have purchased a park hopper ticket, you can't book FP+ reservations from multiple parks. This is a frustration I've heard from lots of people who are seasoned park hoppers and want to maximize every moment of their vacation. In addition, some of the parks have tiered options for their FP+ attractions. This means that you can't score a FP+ for Rock 'n' Roller Coaster, Tower of Terror, and Toy Story Mania at Hollywood Studios. You'd have to pick only one of the popular attractions and then 2 others off of the "Tier 2" list. The only other problem we encountered was nothing to do with the system itself, but our issues of traveling with a toddler. When using FP+, you are locking yourself into attraction times 2 months ahead of time. Couple that with your dining reservations that you booked 6 months out and you're trip is pretty much locked in. Normally not a problem, unless you have a crabby toddler who needs a rest at the hotel and you have to choose whether to stay and use your Festival of Fantasy Parade FastPass or forego your plans you've been making for months and go back to nap at the hotel. At peak times, there is very little hope of switching FP+ reservations at the last minute for the more popular rides and attractions. We ended up loosing 5 of our 15 FP+ reservations during our stay because Brody's schedule didn't jive with what we had thought it would be 8 weeks before the trip. Summary - While my "kinks" section is longer than my "benefits" section, I actually am a fan of FastPass+ when compared to the old system. Is it perfect? No, but perfection is a lot to ask for. And my criticisms aren't meant to be harsh, more of an education for those of you who haven't experienced the new system to know what to watch out for. All in all, with a little research and some advanced planning, you'll find FP+ to be a helpful way to help you see and do everything you hope to experience in Walt Disney World. Good to know!! We plan to take the kids Disney soon and was wondering about the fast pass!! Glad you found it helpful! I'm sure you and your kids will have a great time!